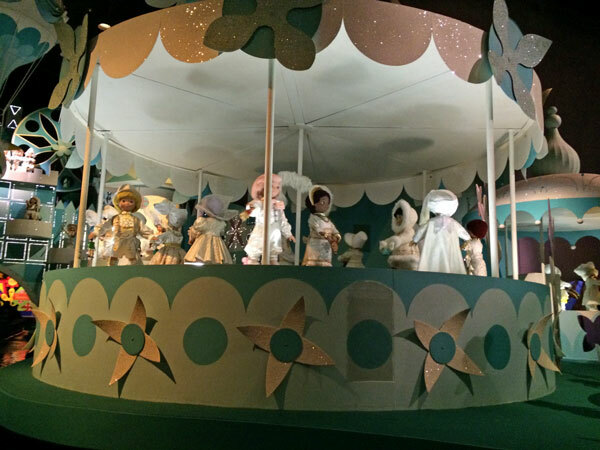 It’s a Small World is one of my favorite Walt Disney World attractions. I like the glitter-encrusted sets, the cute dolls, the catchy song and the last room, where all of the kids play together in a peaceful park without geographical or cultural boundaries. Facebook concluded that we are both wrong. But like Country Bear Jamboree, I’m constantly in fear that The Mouse is going to bulldoze this in favor of something better. Here are my ideas for how It’s a Small World can be modernized just a little bit. Let’s keep in mind that, my love for it aside, IASW is a children’s attraction. 1) When the boat leaves the loading area a Cast Member usually waves us off. Use cameras & MagicBand technology to take photos of the faces of the kids in the boat. 2) Create Small World-style dolls of Disney animated movie characters, and insert them into the scenes alongside the other dolls. Don’t change the song. Don’t make the character dolls take center stage. Don’t replace all of the dolls. Just insert them and let the kids discover them on their own. So little Tarzan can be in Africa, little Wendy can be in England, little Lilo can be in Hawaii, little Belle in France, etc. 3) Create some wall space (yes, you might have to take out some displays) and project the song lyrics, complete with an old-school “follow the bouncing ball” to encourage singing along. I have been on that attraction dozens of times and some people still don’t know the words. Can you believe that? This can fix it. 4) At the final “goodbye” display where the boats are usually backed up, insert some faceless dolls. Project the kids’ faces from step 1 onto the dolls! If there aren’t enough kids to fill them, project regular IASW doll faces on there. The challenge would be designing dolls that would accommodate all colors and flavors of human kids. There may have to be a cast member whose job is assigning faces to dolls, so nothing awkward happens. And there you go – a way to freshen It’s a Small World without compromising the spirit of the attraction. Also, Happy PRESIDENTIAL (35th) birthday to my brother, John. He doesn’t read this blog and even if he did, he wouldn’t slog through my ramblings on Small World to get to this part. But he’s a great brother, a great human and now a great dad. I’d vote for him for President even if he has never changed his Facebook cover image.